College Coach? Click here to view all of Jasi's information. Recently transfered from USTA Southern to USTA Texas in September. - Played #1 Singles and went undefeated in matches from 9th-11th grades all the way through Regionals. 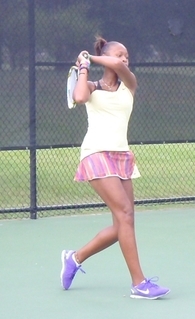 - 3A in 2011-2012, Howard HS Tennis Won Regionals and made it to State Championships "Sweet 16"
I am an energetic female who works hard to achieve my goals by giving my best...each point, each game, each set, each match. I am an all-round athlete who has also run track, played varsity basketball (9th - 11th grade) and varsity tennis (9th - 12th grade) for my school. My agility, speed and conditioning from other sports have helped with my tennis game. I have played the #1 Singles spot each year and have not dropped a game during the conference and during the first round of the state championship. I proudly accepted the title of "Top Dawg" award, the highest achievement given for our tennis team. I started playing tennis when I was six years old, and my highest ranking was #13 in 2005. My desire is to play tennis in college. I am open to different types of schools, although I am focusing on schools that have an excellent music and liberal arts program. My dream, like so many tennis players is to play in the U.S Open. For now, I am dedicated to playing at the collegiate level, with a team that believes that the sky is the limit and that commitment, teamwork, respect for each other, sweat and hard work will get the job done. Invited to play for Billy Jean King's Nashville Team. I played #1 Singles, #1 Doubles and Mixed Doubles playing a total of 7 matches.